Southampton would be on to the FA faster than they were in June. Neymar (now of PSG, of course) organised a Secret Santa present swap as part of a programme on his circle of friends for Brazilian channel SBT. It’s all pre-organised and involves camera crews in Barcelona (for his former teammates) and at Coutinho’s house in Liverpool. “It’s my little brother, Philippe Coutinho,” he says. It comes in a Barcelona bag and is a bottle of Vodka that Phil apparently used to like when they were team-mates together. “What the f***?,” he replies. Never mind. Barca can keep trying every trick under the sun. Liverpool aren’t selling in January. Barca's tapping up knows no bounds. 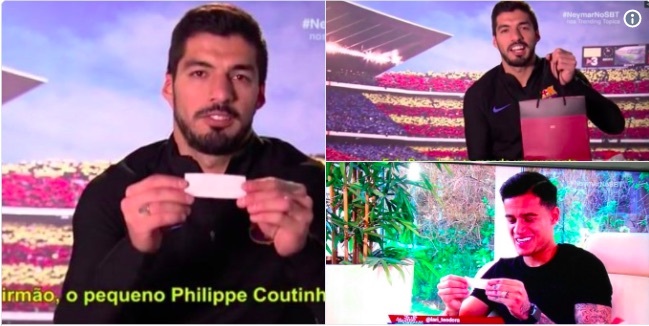 Coutinho included in Secret Santa, oddly organised by Neymar but covered by SPORT, the club's propaganda arm.